Our church magazine is produced every month and around 500 copies are distributed around the village. You can download it HERE, by clicking the magazine below. The readership includes members and worshippers at the church to many local people, who just wish to be kept in touch with what is happening at Lindfield United Reformed Church. Its purpose is to inform and stimulate its readership, Good News has information on specific activities and articles written by those within, and outisde of, the church. 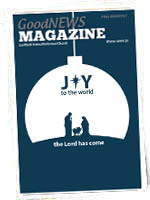 The magazine is freely available from the church concourse and other shops in the village. It is put together by an editorial team from the church if you wish to contribute an article for inclusion into the mag, please email to this address <goodnews@lindfieldurc.org.uk>.